Linked to Erisman Woodlands via Babcock Ridge, the Donald Henne Memorial Tract of the Shunock River Preserve together forms approximately 220 acres. 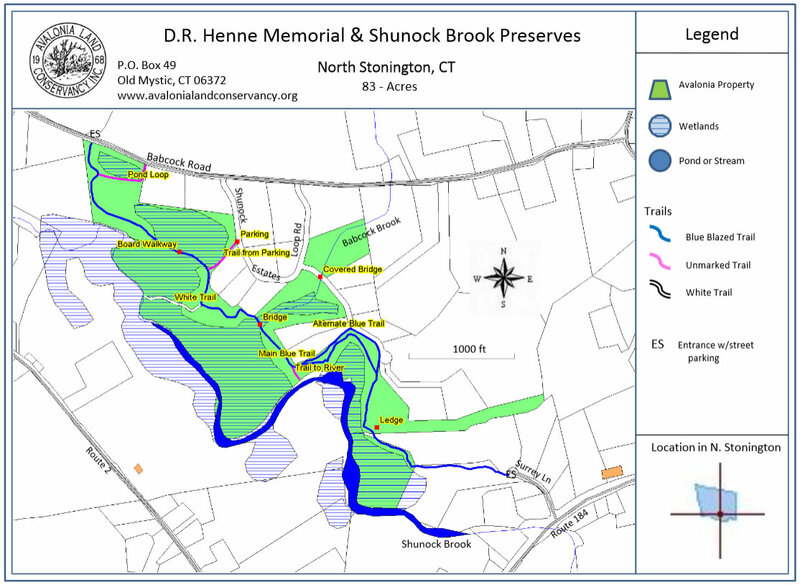 Donald R. Henne Memorial Preserve: 100.2 acres, (2008) 100 Babcock Road, east of Wyassup Road. Stillman Tract : 1.6 acres (1994) Access between 48 and 60 Babcock Road. Milltown Meadows Tract: 8.02 acres, (1995) Access from Don Henne Memorial Tract or from between 11 & 14 Surrey Lane. Parke Memorial Preserve: 3.3 acres (2009) 16 Babcock Road, approximately 0.6 miles east of Wyassup Road. Historical mill site and pond with dam. Main trail extends approximately 1.5 miles from Babcock Road at the north end of the property to the south end at Surrey Lane. Small unmarked side trails.